Paris, July 1942: Sarah, a ten year-old girl, is brutally arrested with her family by the French police in the Vel' d'Hiv' roundup, but not before she locks her younger brother in a cupboard in the family's apartment, thinking that she will be back within a few hours.Paris, May 2002: On Vel' d'Hiv's 60th anniversary, journalist Julia Jarmond is asked to write an article about this black day in France's past. Through her contemporary investigation, she stumbles onto a trail of long-hidden family secrets that connect her to Sarah. Julia finds herself compelled to retrace the girl's ordeal, from that terrible term in the Vel d'Hiv', to the camps, and beyond. As she probes into Sarah's past, she begins to question her own place in France, and to reevaluate her marriage and her life. 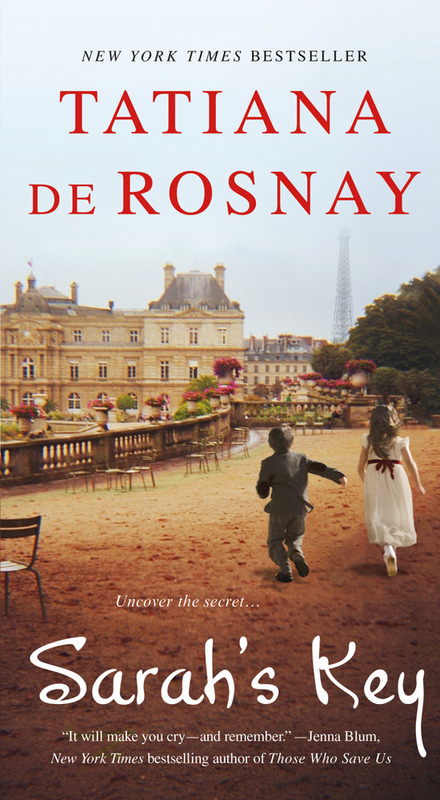 Tatiana de Rosnay offers us a brilliantly subtle, compelling portrait of France under occupation and reveals the taboos and silence that surround this painful episode. Sarah’s Key by Tatiana De Rosnay is a historical fiction novel that follows the interweaving stories of Sarah Starzynski and Julia Jaramond. Sarah is a young Jewish girl who was taken from her Parisan home during the Vel d’Hiv round up. Julia Jaramond is an American journalist living in Paris who comes across Sarah’s story sixty years later. I felt the idea behind Sarah’s Key was excellent, but the execution left something to be desired. I enjoyed the parts which pertained to Sarah, her story was fascinating. The parts which dealt with Julia seemed to come from a different book. Certain parts definitely seemed forced, like when the author introduced a character,Amelie, out of the blue. Really, this character had little purpose, I felt she could have been cut from the story and it probably would have made the book better. I find characterization to be an incredibly important factor in my enjoyment of a book. InSarah’s Key, I felt most of the characters were flat. Julia’s a journalist with a heart but zero personality, her daughter Zoe is perfect, her husband Bertrand might as well be Pepe Le Pew. Boring. The only intriguing character was Sarah, I felt devastated as I read her sections. Her character was the only one who made me actually feel something. I don’t think it’s too much to ask that I feel something for a books characters, even contempt. I understand the difficulty in rating a book pertaining to the Holocaust. If I rate a book too low, it sends the message that I don’t care about the Holocaust, when I really honestly do care. I think it’s important to Never Forget. Rosnay’s purpose in writing Sarah’s Key, I believe was to bring to light the heartbreaking Vel d’Hiv’ round-up and the complicity of the French. I applaud her purpose, I just wish this book had been more well-written. As the majority of Sarah’s Key is set in France, I would recommend drinking a French wine in addition to reading this book. I personally prefer Chapelle St. Arnoux wine. It’s got a gorgeous label, it tastes delicious plus I feel classy when I drink it.